Its horrible and I hate it. You'll be reading something or trying to translate a body of text and there will be a kanji or a kanji compound that you can't remember the meaning or the reading and it feels like its ruined allllll the other work you've done and you just want to erase it from existence. This is just inevitable especially at university. On my course in first semester your expected to learn 12 Kanji a week, their kunyomi, onyomi and compounds that they're in as well. In addition to this you have a chapter of vocabulary and grammar to do, and listening exercises to tie all of this together. (All of this outside contact hours, we do reading and oral grammar practice in contact hours.) In second semester all of that work doubles. Literally. So as you expect your memory begins to burst at the seams. 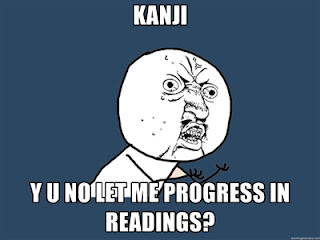 After that big long rant, it may surprise you to now read: Kanji is my favourite aspect of the Japanese language. Why? Its just so interesting, I love the way compounds come together and what their respective kanji mean. Furthermore it is very pretty to write and there is a certain sense of satisfaction you get from learning a really hard kanji My favourite compound at the moment is 'seiza' 星座 which means constellation. What I really love about it though is that the two kanji's respective meanings are 'star seat'. I just find it such a cute image, all those little stars perched on their chairs! This kanji is 'toku' and it means special. The radical circled in red is 'ushi' which means cow. The blue radical is 'tera' and means temple. In India, cows are sacred and are therefore special. Its just a case of linking things together in a way that is memorable for you. You can do the same with the meaning of compounds and the meaning of their individual kanji, like I did with 星座. Its then possible to build on all the stories you create to help remember more and more complicated kanji. Flashcards are also good practice for quick recognition. Kantango is a useful website designed for this. As for learning the readings, I find that I just have to try and memorise them. Sometimes there will be a radical that gives a hint to one of the readings in the kanji and it does help to learn them in compounds and learn their readings that way. Theres no easy way of writing either, a lot of it is to do with muscle memory so its a case of just writing it over and over until you get it. Learning kanji in the proper stroke order helps this process as well. Because of this, whenever you write anything put in all the kanji your supposed to have learnt. Even if you have to copy it. Your still writing is and exposing yourself to that kanji. The temptation can be to just skip over the ones you don't know, but it won't do you any good. You will get the reward of satisfaction when you realise that you actually have learnt it!